The Township of Almora is the district headquarter and has all the facilities for a tourist of twenty first century. This ancient hill station is reputed for it’s health giving climate and is perched on a five Km. long horse saddle shape ridge in between the river Kosi and Suyal and has been a cultural and political region of Kumaun for almost four hundred years, settled by Chand Rajas and nurtured by the British. One can have a panoramic view of the snowy peaks of Himalayas on any clear day and in addition a glimpse of the township with it’s tiled roofed houses and paved streets would take you to the sixteenth century in some thoughtful moment. Nearby places of tourist interest where an excursion can be made within a day are Bright End Corner’s unforgettable sunset, Chitai temple with it’s unique collection of brass bells of all sizes, gifted to the temple by devotees since centuries, Kasar Devi which houses many Europeans who fell in love with the place so much that they settle down, Nanda Devi Temple the cultural and religious center of Almora for now hundreds of years and Lala Bazar a unique market of more than two hundred years with paved streets of stone. Kasar Devi is a village near Almora, Uttarakhand. It is known for the Kasar Devi temple, a Devi temple, dedicated to Kasar Devi, after whom the place is also named. The temple structure dates to the 2nd century CE. Swami Vivekananda visited Kasar Devi in 1890s, and numerous western seeker, Sunyata Baba Alfred Sorensen and Lama Anagarika Govinda. A place also known for Crank’s Ridge, just outside the village, which was popular destination during the Hippie movement of the 1960s and 1970s, and continues to attract trekkers and tourists, both domestic and foreign. Around fifty Kms from Almora the quiet and beautiful cantonment township of Ranikhet, is famous for it’s salubrious climate, balmy breeze captivating and panoramic Himalayan View and soothing and pollution free greenery of pines and oaks. It is also famous as the regimental center of the Kumaun Regiment of Indian Army- one of the most prestigious and the most decorated of all. The Kumaun Regimental museum and amicably maintained grassy and green golf course are memorable experiences even for the most experienced tourists. From Ranikhet four Kms sojourn takes you to the Chaubatiya gardens famous for it’s sprawling orchards of delicious apples, plums, peaches and apricots. It is result of the pioneering efforts of a British settler 150 years ago. 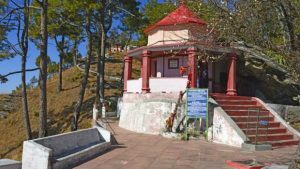 In and around Ranikhet there are some famous temples of the Hindus for religious minded like Jhoola Devi Mandir, Ram Mandir, Herakhan Mandir, Kalika Temple and Binsar Mahadeva. Situated only 30 KMs away from the township of Almora lies Binsar nestled amongst thick forests of Oak and Rhodendron and yet offering surprisingly close views of the Himalayan peaks. The entire region is now a wildlife sanctuary and has a host of wildlife like Panther and Barking Deer. The temple of Binsar lies nearby. One of the many legends concerning Binsar states that ‘Should anyone take away anything belonging to the God or his worshippers and avenging spirit and compels him conscience stricken to restore it twenty fold. Even the faithless and the dishonest are said to be reformed by a visit to Binsar. Kausani, situated around 52 KMs from Almora is famous for it’s breathtakingly close view of the Himalayan Peaks and it’s solitudes and greenery. The wide expanse of the famous Katyur Valley lies in front of it as you wake up to experience the Kausani sunrise. Kausani’s beauty arrested the feet of even Mahatama Gandhi, who stayed for some time at this place. The memory that brief stay of that great man lingers behind in the Anasakti Ashrama. Another great man of India the famous Hindi poet Sumitra Nandan Pant was born here. There is small museum to earmark that sacred spot. The famous folk singer Gopidas was also inspired by the beauty of Kausani. Pinnath (10KMs), Bura Pinnath (5KMs) and Bhakot are the highest points near Kausani. Situated between Ranikhet and Almora this picturesque place not only affords a wide view of the Himalayan peaks but is also full of fruit orchards. Scouting camps are frequently held here and there is a beautiful temple of Syahi Devi around 3 KMs away on a lovely mountainous trail. The birth place of the first chief minister of the province of Uttar Pradesh, Pandit Govind Ballabh Pant is a place called Khunt situated nearby. Some years back a centenary memorial has been built at this place to commemorate the memory of this great son of the soil. Situated 35 KMs away from Almora in picturesque surroundings Jalna offers a wide panoramic view of Himalayas. There are a number of orchards which produce a number of variety of fruits such as apricots, peaches, peers, plums and apples. Manila literally means enchanting. The famous temple of Manila Devi , the family goddess of Katyuri kings lies around 85 KMs from Ranikhet. The surrounding forests and the Himalayan views from this hill ridge are worth remembering. Situated around 17 KMs Northwest of Almora, Katarmal is famous for 800 years temple dedicated to the Sun God. The only temple in India dedicated to Sun is the Konark temple in Puri at Orissa. Situated in a wide valley of the river Ramganga, Dwarahat lies around 32 KMs from Ranikhet. And is a very important town from both Historical and archeological point of view and may also have been the capital of some branches of Katyuri kings. Around 10 KMs from Dwarahat lies the famous Doonagiri temple atop a hillock which is famous in legends for containing the herb drug Sanjivini. The temple dedicated to the goddess Durga is situated in the midst of beautiful and dense forest and a tea estate. Some distance from Dwarahat lies the temple of Naithan Devi. Situated around 35 KMs from Almora, Jageshwer one of the most important religious places of Hindus in Kumaun and is believed to be the abode of the one of the twelve ‘Jyotirlingas’. It is even mentioned in the great epic of ‘Mahabharata’. The great temple complex is situated in a narrow and beautiful valley covered with Cedar trees. Two streams Nandini and Surabhi flow down the hills and meet near the sacred spot. Dense grove of Cedar trees, perpetual verdure, and sweet murmur of the riverlets give a peculiar charm and sanctity to this place. Their are 124 temples and hundreds of magnificent statues of exquisite craftsmanship. The oldest shrine is of the ‘Mrityunjaya’ and the biggest shrine is of the ‘Dindeshwara’. During the monsoons their is huge fair held every year at Jageshwer.